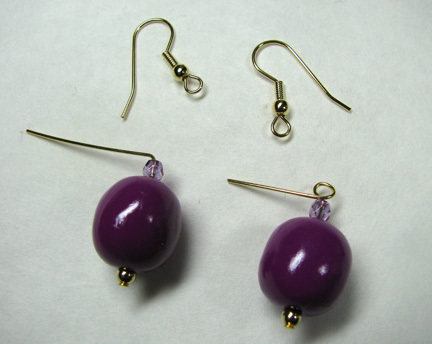 The easiest earrings you can possibly make with polymer clay! But the benefit is that you will get lots of practice rolling even balls of clay and making nicely even holes in your beads. Make lots and you can have earrings in every color imaginable! 1. Roll out an even log of polymer clay (I use a flat piece of plastic to keep it even), and use a ruler to cut equal-sized slices of clay. Roll into balls in your hands...this will take some practice to get them a nice even size and shape, so make more than you need and choose the best ones for your earrings. 2. Use a nail or an awl to pierce the bead. Work from both sides and twist the nail gently so that you don't distort the shape of the bead. 3. 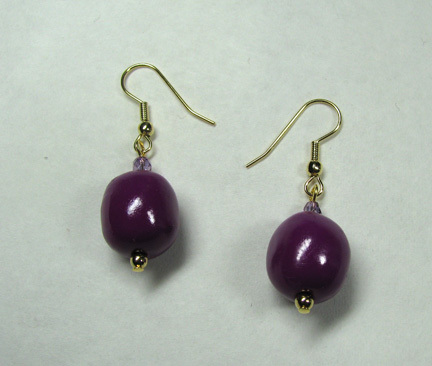 Hang the beads on a wire and bake them according to the clay manufacturer's directions. I like to suspend my beads over a pie pan so they won't get flat spots. Sand and polish your beads when they are cooled, and apply a coating of Future floor polish if you like. 4. 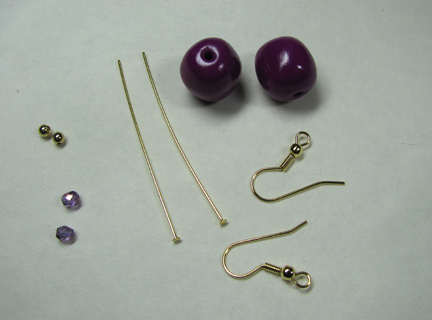 Choose some accent beads and use head pins to construct your earrings. I turned simple loops rather than wrapped loops since the design is so basic. Open the loops on the bottoms of the ear wires and attach the dangles. October is polymer clay month on Beading Arts!